Welcome to the OSU Across-Breed EPD Calculator. This software is a tool for commercial cattlemen to compare sires of different breeds. Please find below the software for download (Microsoft Excel required) as well as instructions for use. 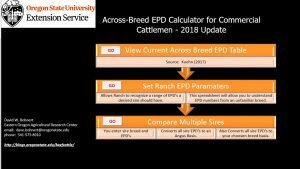 For questions about the OSU Across-Breed EPD Calculator, please contact David Bohnert (dave.bohnert@oregonstate.edu or 541-573-8910). © 2019 Beef Cattle Sciences, all rights reserved.